Its very rare! or may I say that almost never seen Saber-toothed whale was picked up from Venice Beach on Wednesday, October 16, 2013, reported by the Los Angeles Times news. Heal the Bay's education specialist, Nick Fash said, "We were very lucky," then added, "These whales are incredibly rare and almost never seen in the wild." These 15-foot long whale was reportedly seen overnight when it washed ashore in Venice Beach. The Saber-toothed whale will undergo necropsy to determine how the whale died and what other information about its diet, according to Nick Fash. According to The Examiner, "Stejneger's beaked whales are known for diving deeply into the frigid body of the north Pacific Ocean to dine on such cephalopods as squid." For the meantime, please bookmark this page now or visit this site more often for you to be updated. You may also share this post to your friends so they may know about Saber-toothed whale. 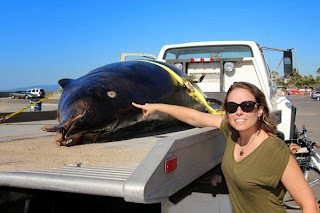 Comments or suggestions about "Saber-toothed whale picked up from Venice Beach " is important to us, you may share it by using the comment box below.